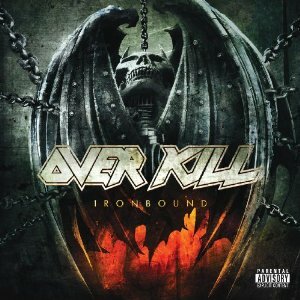 Hall of the Mountain King: Review: Overkill, "Ironbound"
Despite the fact that I was a teenager during the band’s heyday, it was much later before I actually came to appreciate Overkill. But even if I had never come around to them, this album would certainly be enough to make me a fan. They may be 25 years or so into their career, but “Ironbound” will stand as easily one of the band’s best efforts ever. It opens with an anthem dedicated to their fans, “The Green and Black,” representing the classic colors of their logo. After a bit of lead-up, the song strides into familiar thrash territory that should make fans of their classic 1980s sound happy. Then, just over four minutes in, the track breaks down to a slower, headbanging riff before amping up for a frenzied finish. It’s a fine example of what fans can expect from what’s to come. The title track is another solid thrasher with roots in the classic Overkill sound. It serves up one of the stronger guitar riffs from guitarists Derek Tailer and Dave Linsk. Vocalist and founder Bobby “Blitz” Ellsworth delivers some memorable vocal hooks throughout the song, and there’s also a nice change of pace near the middle of the track where Tailer and Linsk get to show off again with a clean guitar lick and a lead reminiscent of some of Alex Skolnick’s work with Testament. This song alone might be worth picking up the record. Musically, the record has its aggressive moments, like the pummeling drums and riffing of “In Vain,” and some quieter darker moments, like the opening of “The Head and the Heart” or “The Goal is Your Soul,” which opens with a clean guitar lick as the thrash riff fades in under it, a la “And Justice for All” era Metallica. “Give a Little” provides one of my favorite guitar riffs on the record, with a brief, bending lick inserted between slabs of thrash that shouldn’t fit, but somehow works. The song also features some punkish influences on the chorus. “Ironbound” is a record that simply doesn’t let up from start to finish, and it’s another example of the old guys of the genre just flat-out throwing a whoopin’ on the younger bands that have taken up the thrash flag. You’d be hard-pressed to find a better thrash record in recent years, or perhaps even in Overkill’s catalog. Review: Manimal, "The Darkest Room"
Review: DareDevil Squadron, "Out of the Sun"
Review: Armored Saint, "La Raza"
Review: White Wizzard, "Over the Top"
Review: Shooter Jennings, "Black Ribbons"